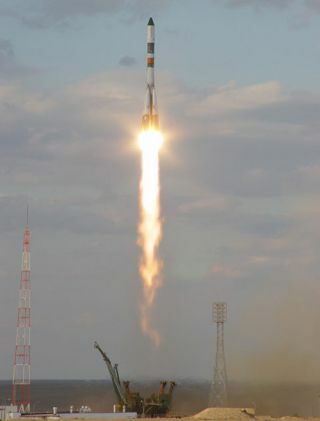 A Soyuz rocket carrying the unmanned freighter Progress 19 launches toward the International Space Station (ISS) from Baikonur Cosmodrome in Kazakhstan. An unmannedspacecraft docked at the International Space Station (ISS) with ease Saturday,delivering a fresh batch of food, oxygen and other vital supplies to the twoastronauts working onboard the orbital laboratory. Theautomated Russian-built cargo ship Progress 19 appeared to perform flawlesslyas it docked at the aft end of the space station's Zvezda service module at10:42 a.m. EDT (1442 GMT), a full eight minutes earlier than expected. ISSExpedition 11 commander Sergei Krikalev and flight engineer John Phillips - thestation's current crew - watched over the supply ship's arrival and wereprepared to take over control of the spacecraft remotely if necessary. Afailure in the automated guidance system of the last cargo ship to visit theISS - Progress 18 - forced Krikalev to take command. But thatwas not the case today and Progress 19 reached its berth with no need forintervention by the ISS crew. "Congratulationson the docking and also a belated happy birthday to you," Nikolai Sevastianov, chiefof the Russian aerospace contractor RSC Energia, told Krikalev after docking. Krikalevcelebrated his 47th birthday on Aug. 27, and has spent more days inspace during his lifetime than any other astronaut. Progress 19'sdocking ended a two-day flight for the supply craft, which began with a Sept. 8launchfrom Baikonur Cosmodrome in Kazakstan. Stowed aboardthe cargo ship is more than 5,175 pounds (2,347 kilograms) of material, amongwhich are 1,760 pounds (798 kilograms) of propellant, 242 pounds (109kilograms), more than 459 pounds (208 kilograms) of water and about 2,700pounds (1,224 kilograms) of dry cargo. Russianflight controllers went over plans for opening Progress 19, which called forhatch opening at about 1:45 p.m. EDT (1745 GMT) today and the first unloading operationsto begin Sunday. "Thatsounds good to me," Krikalev responded. One of thekey items aboard Progress 19 is a replacement liquids unit for the spacestation's Russian-built Elektron oxygen generator. Thegenerator, the primary source of oxygen aboard the ISS, failedearlier this year. Krikalev and Phillips have relied on oxygen stored in tanksaboard past Progress ships and solid fuel oxygen generators (SFOGs), known as"candles." NASAofficials said the new liquids unit should help Krikalev and Phillips repairthe Elektron unit, an activity scheduled to begin Sept. 15. RussianProgress cargo ships make regular resupply flights to the ISS and were a vitalasset to maintaining the space station when NASA grounded its space shuttlefleet following the loss of the Columbia orbiter and its crew in 2003. Whilethe space shuttle Discovery recently visited the ISS this yearduring its July-August flight, the need to reduce external tank foam shedding -which also doomed Columbia - and damage to key NASA facilities by HurricaneKatrina have left the next shuttle launch date in limbo. NASAofficials said that Progress 19 was fitted with 14 extra tanks for its supplyrun, which allowed it to deliver an additional 132 pounds (59 kilograms) ofoxygen to the ISS. Thespacecraft also delivered supplies for the ISS Expedition 12crew, commanded by Bill McArthur of NASA with cosmonaut Valery Tokarev servingas flight engineer. The two astronauts are set to launch spaceward late Sept.30 (though it will be Oct. 1 at their Baikonur Cosmodrome launch site) withspace tourist Greg Olsen. Krikalevand Phillips will return to Earth with Olsen on Oct. 11, NASA officials said.